There was worrying poll news for David Cameron on the eve of his Tory party conference speech this afternoon, reports Left Foot Forward’s Shamik Das. 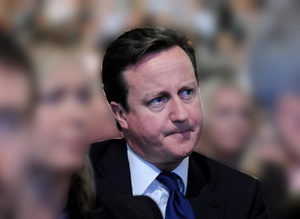 There was worrying poll news for David Cameron on the eve of his Tory party conference speech this afternoon. A ComRes poll (pdf) for last night’s ITV News at Ten found 57 per cent of the public believe the prime minister performed badly in managing the eurozone crisis to the UK’s advantage, with 54% believing he performed badly in providing economic leadership and half saying he responded poorly to the News International phone hacking scandal. However, there was better news for Mr Cameron on his statesmanship, his handling of the riots, and when compared to some of his predecessors. Fifty per cent say he responded well to the riots, 51% say he delivers a statesmanlike presence, and 49% say he is a better prime minister than Gordon Brown, with only 22% saying he is worse. It is only when pitted against Margaret Thatcher and Tony Blair, Britain’s most successful post-war leaders, that more people believe he is a worse than better prime minister, the Tory leader recording advantages over Ted Heath, Jim Callaghan and John Major. In his speech today, Mr Cameron, echoing Ed Miliband’s “we are the optimists” speech from last year, will deliver a rallying cry for a “can-do optimism”, insisting Britain’s best days “are not behind us”. On the economy, he will urge households to pay off their credit cards to help the country recover from what he calls “no normal recession”. “The only way out of a debt crisis is to deal with your debts. That means households – all of us – paying off the credit card and store card bills… We need to tell the truth about the overall economic situation. “People understand that when the economy goes into recession, times get tough. But normally, after a while, things pick up. Strong growth returns. People get back into work. This time, it’s not like that. And people want to know why the good times are so long coming. In another echo of Mr Miliband (his speech last week), he will also vow to confront “vested interests” – yet quite how remains to be seen. There are not expected to be any new policy announcements, with Mr Cameron sticking like glue to the coalition line on the economy, saying “our plan is the right one and our plan will work”, though this morning’s Times reports (£) he will come down strongly against the Human Rights Act, backing Theresa May over Ken Clarke following yesterday’s “cat gate” shenanigans. Left Foot Forward will have reaction to David Cameron’s speech later this afternoon.